These days the media leaves a lot to be desired. But we are desirous. We want good storytelling, complexity, our world inside many worlds, and evidence that it isn’t all just bad news. We want harmonies as well as melodies—not just notes to fill the space. We crave the sound of those who do things we’d never dare; the insights of others who came back alive. We want to laugh and kick back; stir things up. And everyday to change the world around us with the microphone, tape, a thousand little radios. 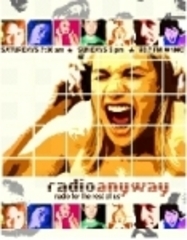 Radio ANYWAY is shouts and whispers from our neighborhoods to yours. Hey, we live here, this is our home! A grouping of Poems read by Claudia Schmidt, each with improvised musical accompaniment. A weekly perusal of old customs, folklore and anecdotes.